"Gays didn't need to ask if they were gay. God told them. And if God told them, that's all you need to know, 'cause He's God and He wouldn't have made people gay unless He thought it was right. How do I know this? Because He's God and He's smarter than you. And if you don't like what I just said, tough. That's the God I believe in and that's the way He thinks. Maybe your God will have some thoughts someday." Jay Bakker, whose name I shall follow with the obligatory "son of Jim and Tammy Faye," gets an excellent profile in this week's New York Magazine. But as I’m sitting there, close to the back and beer in hand [note: Revolution NYC meets at a bar], it occurs to me that maybe the opposite of faith isn’t doubt. Maybe the opposite of faith is certainty, a comforting belief in your own rightness. 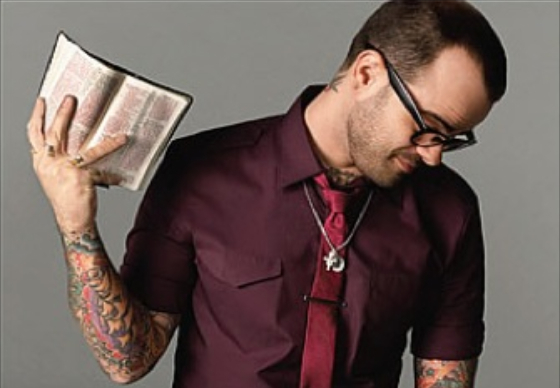 To a greater degree than most Evangelicals may care to admit, Jay Bakker’s open-armed ministry is an extension of what his parents created. Jim and Tammy Faye were much more tolerant than other televangelists; in 1986, Tammy Faye famously interviewed a gay minister who had been diagnosed with AIDS. But theirs was a theology of aspiration—believing is easy, and believing leads to success—and it didn’t encourage its followers to doubt their faith or themselves. 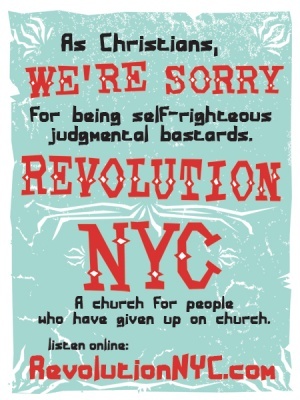 This, it seems to me, is what Jay is offering: a Christianity that allows for, and is even sustained by, failure. I'm going to repeat that last line, because I love it: "A Christianity that allows for, and is even sustained by, failure." An interesting detail: Morris refers to Bakker as part of the Emergent movement. I'm not surprised that he says Bakker won't use the term himself; among Evangelicals (of whom Jay, however liberal, is one), "emergent" is considered a sort of half-boast, half-pejorative, like "hipster. "* Be that as it may, this is the first time I've seen the emerging church given attention in a major New York City-based publication. I've been wondering when the Emergent movement would start making its way over to the East Coast, and this could be the first harbinger. * I don't know why this is, exactly, although there's a certain teen-like brattiness that can come with the rejection of the mainstream church. 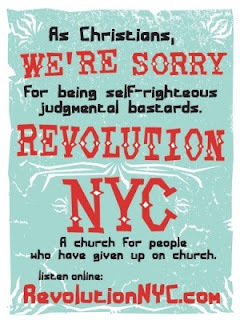 For example, Emergent Church icon Tony Jones once told me in so many words that my lovely Brooklyn church is doomed, because we follow the Presbyterian bylaws and meet in a historic church building. 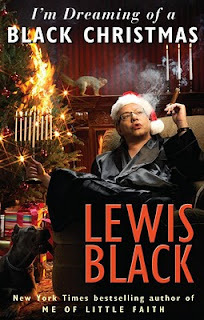 ** And yes, if were wondering, "liberal media" in the headline is indeed supposed to be tongue-in-cheek; I have two (non-religion-related) articles in the same issue of the magazine. Husband Kody's first three wives think his fourth wife is a ho because she kissed him before they were married. God, I love Mormons. Vintage "Politically Incorrect" clip in which the Senate candidate explains that, if she were hiding Jews in her attic during WWII, God would save her from having to lie to Hitler. And then Eddie Izzard and Bill Maher make fun of her. The Village Voice's news blog featured God Spam this weekend in a piece about Jacob Isom, of "Dude, you have no Quran" fame. The article, by Leslie Minora, specifically focuses on the merchandise I whipped up in honor of Mr. Isom. You can read the story here. From the interview: Watkins, a freelance writer and the daughter of a minister, says she started her quirky religious blog because she's "always been really fascinated by the intersection of pop culture and religion...[this type of blog] didn't exist, and I wanted to read it." Isom seems the personification of the very intersection Watkins explores. I wouldn't say he's exactly at the intersection that this blog explores. If David Isom had grabbed the Quran while singing a verse from the lost Gospel of Thomas to the tune of "Bad Romance," then we'd be talking. However, The Voice is absolutely correct that David Isom's story has a special appeal for me. Ironically, I had deliberately avoided covering the Amarillo Quran-burning story at first, for the same reason that I won't write about the Westboro Baptist Church: both stories center around a small group of bigots whose message distorts the Christian faith, and who are ultimately powerless except in their ability to get media attention. I do not want to feed that particular beast. But I am not the mainstream media. By the time the book-burning was actually scheduled to take place, the nation's entire freedom of religion apparently hung in the balance of one deluded pastor and a park grill. The Unitarian Universalists, God bless 'em, mobilized en masse to stop this event from taking place. And then one shirtless stoner thwarted the entire event by doing the most practical thing imaginable: taking the holy book away. And since apparently no one had a back-up Quran (which I do, in fact, find hilarious), everybody just went home. With one spontaneous act, David Isom brought this clash of faiths down from the ideological clouds to a very human level. And that's the element that's so often missing from press coverage of religion stories: the fact that the participants are individuals, and even if they all believe basically the same thing, they no doubt have very different reasons. No one was hurt that day in Amarillo; no individual freedoms were lost. In the end, there was just a man who looked down and realized he had no book to burn. Footnote: I am 99% certain that God Spam is the point of reference for this article from the Amarillo Globe-News, as no one else to my knowledge is selling "Dude, You Have no Quran" hats. That article's reference to hats and T-shirts was also featured in The Week. And as a result of all this publicity, I have sold... 3 shirts! And no teddy bears. 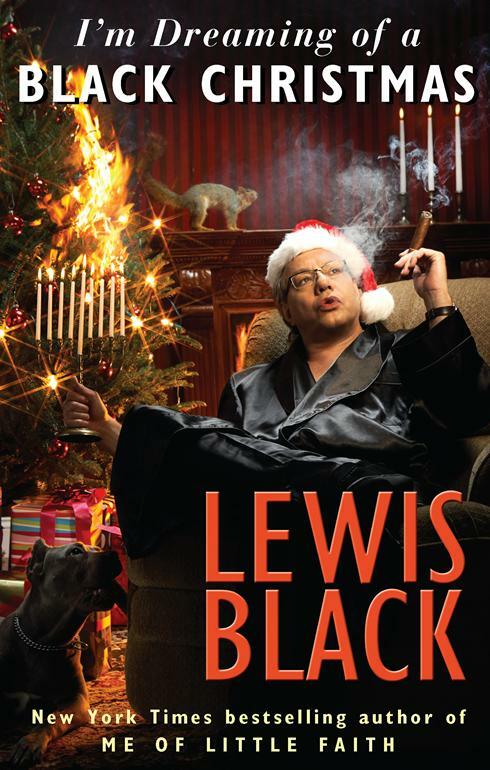 Come on, guys, Thanksgiving is coming. That's the traditional holiday of meme-themed plush toys. Every once in a while, an everyman utters such a profound statement that we must grant him our culture's highest honor: a slogan T-shirt. Ladies and gentleman, Jacob Isom is such a man. Although there were dozens of protesters making a stand against the scheduled Quran burning in an Amarillo, Texas park, Isom single-handedly thwarted the Christian hate parade by yanking the sacred text off a burning grill. In his own, now-immortal words: "I snuck up behind him and took his Quran. He said something about burning the Quran, and I said, Dude, you have no Quran." Jacob Isom, in honor of your bold stance against religious intolerance (and the fact that you said "dude"), God Spam salutes you with this custom T-shirt. 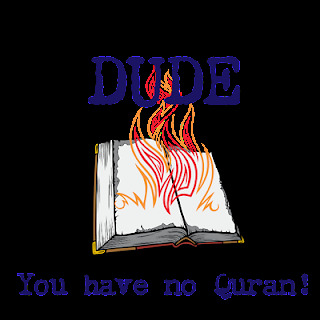 The "Dude, you have no Quran" shirt is now available for purchase, in assorted colors and styles, at the brand-new God Spam online store. 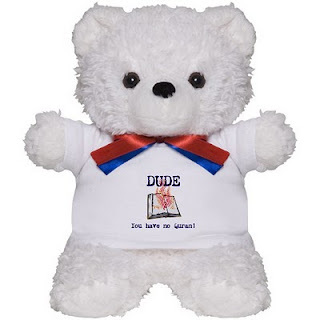 And since Cafe Press, as it turns out, is insane about customization, you can also get your own "Dude, you have no Quran" teddy bear. Or perhaps you'd prefer an extremely American-made dog T-shirt? But Jacob Isom, this post is really about you. God Spam salutes you, your bravery, and your weird cooking show pilot that we found on YouTube. All Americans should be proud to wear your words. 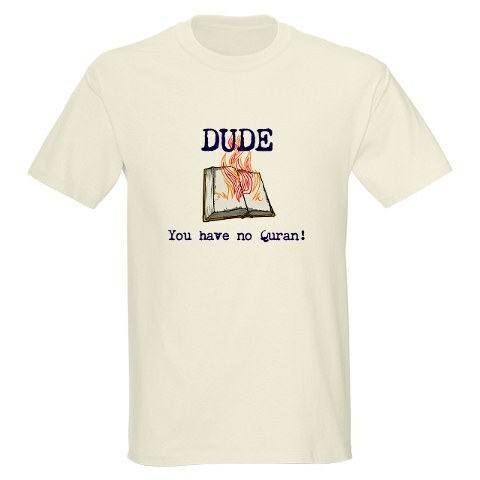 Update: Isom is now promoting official "Dude, You Have No Quran" shirts with his face emblazoned on them. Go here to buy one. So many options! 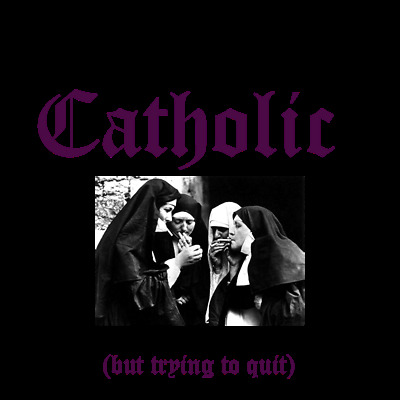 Since last week's post prompted some lively discussion on Anne Rice's Facebook page, this seems like a good time to ponder something that Rice has made me think about: the difficulty of quitting Catholicism. I should clarify, to start, that I'm not a Catholic; rather, I'm a Prod with Italian roots, a nun obsession and a love of early church history. I named my son after Saint Anselm. So rest assured that I'm not trying to be flip about the Catholic Church here. I see a great deal of beauty in Catholicism. When Anne Rice first declared her conversion into the Catholic Church, I thought it made perfect sense. The things that resonate about her books -- the conflicted relationship between passion and morality, the grand drama on a larger-than-human scale, the tantalizing nearness of death -- are all very present in Catholic tradition and ritual. And now she is walking away, not from her faith, but from the Church. Here's what I neglected to mention in the previous post: after declaring that she'd "quit being a Christian," Rice received a public invitation to join the socially liberal United Church of Christ (supported, of course, by an enthusiastic Facebook campaign). When she demurred, the LA Times asked Rice flat-out, How can you say no to that? Her response was diplomatic and honest: "I respect completely people who want to find a church that's more in accord with what they can morally accept. But for me, walking away is the thing right now. In the name of Christ, in the name of God." Now, I love the UCC. I love their proud acceptance of different lifestyles and sexualities, I love their willingness to embrace change, and I love that their entire outreach campaign is based on a Gracie Allen quote. But the UCC is not the Catholic Church. For everything it offers, it lacks the rituals, the thousands of years of history and culture, the globe-spanning universal language of Catholicism. Now: did Anne Rice leave the church entirely because she thought it would make a stronger political statement than joining a more liberal denomination? Or did she leave because nothing can truly replace Catholicism for her? I've watched many friends struggle to quit smoking, and it's always seemed to me that the hardest part of quitting smoking is that nothing can really take its place. 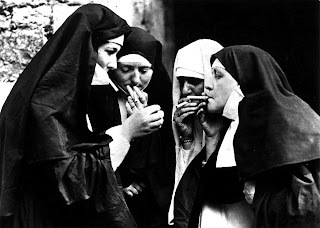 There is no alternative activity that incorporates relaxation, socializing and ritual in the same way that cigarettes do. There's nothing you can do with your mouth and hands and breath that can replicate the feeling of having a cigarette. 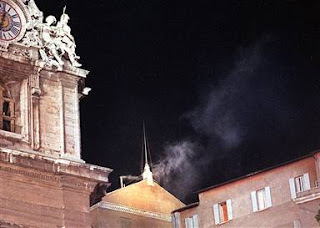 Similarly: there is nothing else in the world like the Catholic Church. Some would argue for the Episcopal Church as an adequate replacement, but for many who have fallen in love or been raised with Catholic tradition, it will never be more than adequate. Remember: selecting a church is a deeply personal thing, and it can be more about a feeling of presence and belonging than about a series of check marks on an "agree/do not agree" list. 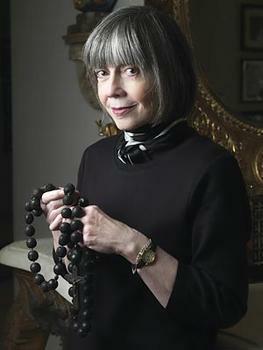 Anne Rice says that she'll "very much miss" going to Mass and participating in Holy Communion. Her decision sounds heartbreaking. But sometimes, going cold turkey is the only option. Because the single most important lesson we can take from Jesus' teachings is not to kiss people. How Do You Pray for a Rock Star? 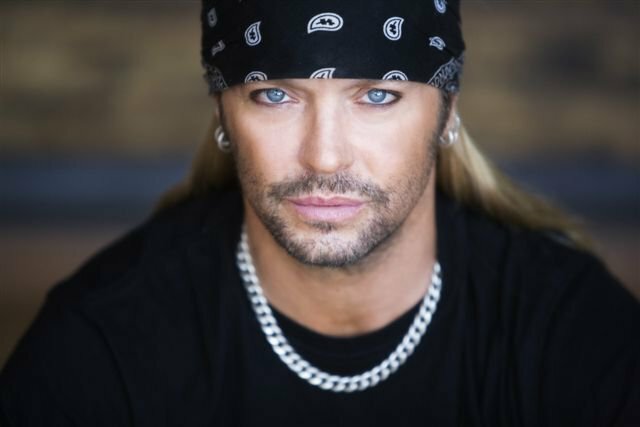 May God watch over you once again as He has several times.Bret my thoughts and PRAYERS are going out to you,Please Lord help This amazing Kind Wonderful Soul of a Human Being Heal Quickly and Completly,He is a wonderful source of inspiration to many,This world Needs more People like Bret Michaels in it,Keep him Safe and Please Lord Help him Heal,God Bless you Bret Michaels,I prayer for you Everyday,Bret we all love you,God Speed to your retuning Health,Love you Bret. I pray for you Bret, I pray that you have a full recovery and the angels protect you always. Rest and the angels will heal you. I'm not a religious person, but I owe you.... your music and you have pulled me through some tough times. So now I will pray for you in your time of need. 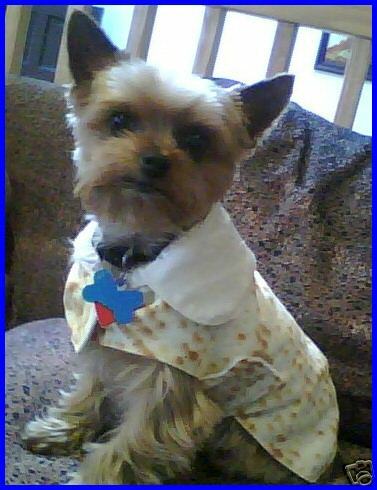 May the blood of Jesus cover you bret micheals and shield u from all harm. May the angels guard you and protect you, and i pray your surgeons and physicians and specialists all have supernatural gift and knowlegde to heal you. I beg our Father to stop the bleeding to seal shut the damage vessle or vessles and to protect your brain from all harm so... See More that you have a full recovery. May u awake with a powerful testimony for God. 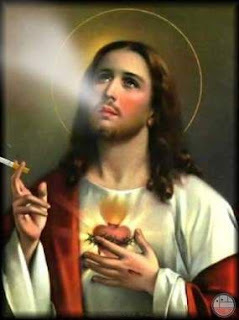 Thankyou Jesus, Thankyou our Father, I love you God. In Jesus Name Amen. Edward Cullen: Vampire, or Perfect Mormon Boy? Edward ... doesn't believe in open mouth kissing, swearing, chewing tobacco, drinking caffeine, and enjoys time with his family. HE IS THE PERFECT MORMON BOY. Every time SMeyers would write about Edward, I would just boggle. She was drawing from everything we Mormons were taught about Good Ol' Joe - he was handsome, shockingly so, he could draw you in with just his presence, let alone when he spoke, down to his freaking nose and hair color. HI THERE CREEPY AUTHOR WANTING TO BONE YOUR PROPHET. 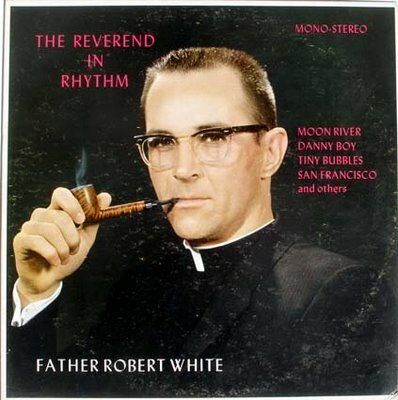 Twilight is essentially an allegory of one gentile seeker’s coming to the fullness of Latter-day Saint faith and life. Bella, though, as Mrs. Meyer’s stand-in, is also a modern American woman who struggles with Edward’s patronizing misogyny and over-protectiveness. Her mind is the only one in the book not open to him, which serves both as an indication of her reverential reserve towards him as God or prophet and her resistance to being totally subject to him. Though devoted to and in love with him, she sounds notes throughout the series that reflect something like feminism. I suspect Granger is giving Meyer too much credit here, but the books definitely seem rooted in traditional Mormon family values, as Samira K. Mehta discusses over at Religion Dispatches. "I’m a little concerned about Twilight, because these are the most unrebellious vampires we’ve ever seen. They are essentially Mormon vampires... The vampire has gone from being a horrible monster to the kid next door. So we’ll see what happens. Perhaps Edward Cullen will be the last vampire." Mormon underwear image from Altarkation. 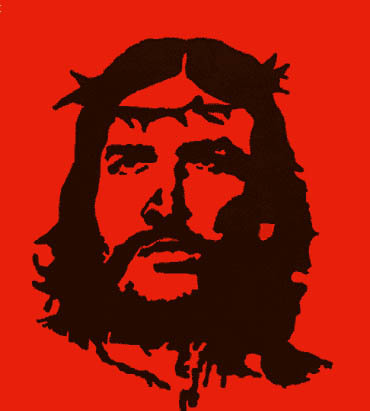 Did Jesus Invent Universal Health Care? In Jesus, God was hip-deep in health care reform. It was a spiritual issue. It became a political issue. John’s gospel says that it was Lazarus talking about his short stint in the grave that finally decided authorities on plans to execute Jesus as a criminal. When a nation can’t get its healing powers working for all the people, of course its dysfunction will eventually become a political issue —- that is, a human power struggle. But it is not equally obvious that the people of a nation as sick as ours are first of all in a spiritual struggle. Our inability to do deeds of health care power is the manifest symptom, but unbelief is the real cause. -- From an amazing piece of writing on the spirituality of health care by the Reverend Stephen H. Phelps. Ever see a sermon get a standing ovation? This one did. 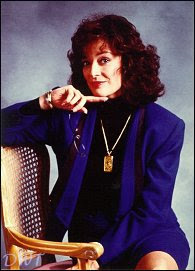 In real life, Designing Women's Dixie Carter was a conservative Republican -- but for 7 years, she played one of the most outspoken liberal Christians in TV history. Julia Sugarbaker, who managed the show's interior design business, was a devout Southern churchgoer who argued for separation of church and state, equal treatment of gay people (a cause which Carter also supported) and the ordination of women. Jezebel has some great clips of Julia speechifying on those first two topics -- but the episode that made the biggest impression on me is "How Great Thou Art" (1988), which made a passionate case for the ordination of women. I couldn't find the whole episode online, but this impressive fan site contains an episode description, historical context and guide to Biblical references. And there's one clip on YouTube: Dixie Carter singing the title hymn, below. RIP Dixie; thank you for giving us Julia Sugarbaker. And thanks also to Linda Bloodworth-Thompson, the writer who created the character and wrote the episodes mentioned above. Perfect for teaching the kiddies about infanticide! The clown, in case you were wondering, is supposed to be hail. Though we prefer the idea that there was an eleventh, forgotten plague... of clowns. Why is this night different from all other nights? Because tonight, the dog is dressed like a matzoh ball. "Honey, where did you put the credit card statement? "It's on the fridge, underneath the boils!" 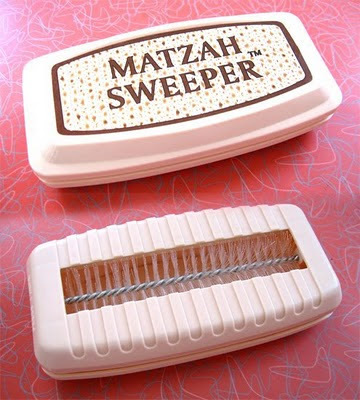 My favorite part of this semi-useful product is that words "Matzah Sweeper" are trademarked. You know, in case you were thinking of naming your band that. Via the Allee Willis blog. Happy Passover from the prodigals at God Spam!